Roger Lee, executive director for Economic Development for Central Oregon, asked for a show of hands: Who knew that Friday was National Manufacturing Day? A few sparse hands in the audience of about 40 people went up. "It's not well advertised," he quipped. To commemorate the occasion and showcase some of Prineville's manufacturing companies, the regional organization launched the Made in Crook County Tour this past Friday. The event, sponsored by Bend Broadband Business, featured 90-minute tours of Contact Industries and BTL Liners, two large-scale businesses in the community whose customers span the country and other nations throughout the world. Caroline Ervin, Crook County's Economic Development manager, led the event, which featured a post-tour luncheon and discussion session at Meadow Lakes Restaurant. "It was a wonderful opportunity to showcase two great local companies and for participants to see some of the amazing products manufactured right here in our community," she said. The day started at the same restaurant where local elected officials, businesspersons and civic leaders boarded a school bus that shuttled them to and from each destination. The first stop was Contact Industries, a plant that Casey Jackson, vice president of manufacturing, stressed is an engineered component manufacturer, and not a wood component manufacturer. "We have whole warehouses of aluminum, steel and PVC that we might mate wood materials with," he said. Because the plant, which covers 82 acres, is so large, the tour group was split into two, with one group taken to a portion of the facility where breakdown of western pine lumber is completed to optimize grades, rips and yields to enable Contact to fulfill its orders further down the plant site. There, Jackson led people past a large collection of equipment including finger joiners and machines that cut or segregated different defects or characteristics from wood for use in different parts of the plant. "We do a lot in the architectural and commercial side of things, where we are doing a lot of ceiling systems in airports and stadiums, even the new World Trade Center," he said. "Huge jobs, one-time jobs that may be upwards of $1 million." The second leg of the Contact Industries tour was led by Lower Plant Manager Mike Curtis, who showcased where several different products are created. People were shown the process for lamination, which Curtis said in basic terms is gluing pieces of wood together. They saw where numerous types of moulding, including some that are very specialized, and profile wrapping. As Curtis put it, if someone can imagine something wrapped in a certain type of veneer, Contact staff can probably find a way to do it. "We've got a lot going on here in Prineville," Curtis remarked as he concluded his tour. Next, the tour group was driven up the grade to BTL Liners, a company with a nearly 40-year history in Central Oregon, 11 of which have been in Prineville. Vice President of Sales Jared Santoro points out that the company is "the leading worldwide supplier and fabricator of woven-coated RPE liners and covers for water and fluids contaminant in a wide variety of applications." BTL was once known as Bend Tarp and Liner when it was first founded by Ron and Lynne Perlatti in Bend in 1981. By 1996, when Brad Elliot and his wife, Jan, bought the company in 1996, the company had moved into a 10,000 square foot location. Business would later demand an even larger space and in 2007, BTL Liners opened an 84,000 square foot place of business in Prineville. "It has been great," Elliot told the tour group on Friday. "EDCO found us a place here and we have been very happy here in Prineville." Santoro and fellow company vice president Travis Wilcox showed visitors its massive building. 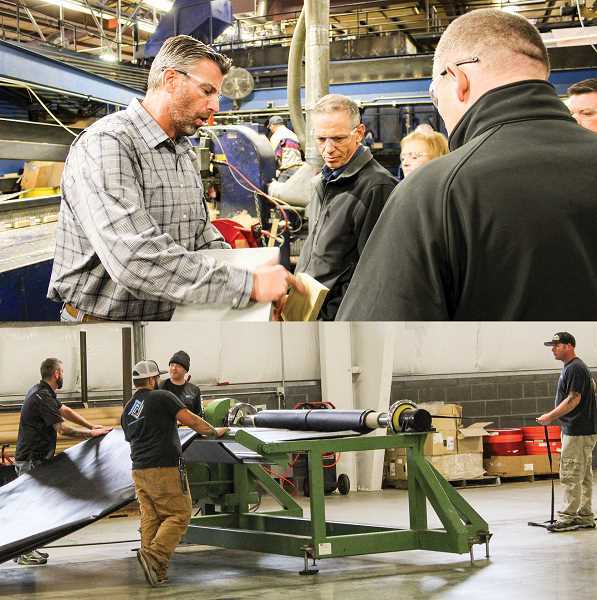 Much of the floor space is left open to enable workers to roll out large sections of different geomembranes or construction fabrics to complete orders for customers throughout the U.S. and Canada. A promotional brochure shows a single-piece fabricated panel that covers 150,000 square feet. Santoro showed the tour group how workers weld the different liners together, fold them and roll them up for delivery to customers. He highlighted areas where work is done on heavy liners, custom products and lighter liners. "Prineville is great," he said. "Even though we are in a fairly small community, the width in which we reach, as far as our products and sales, is great in Central Oregon and a lot of places elsewhere." During a luncheon and discussion that concluded the Made in Crook County event, Lee said he hopes see the event continue to grow. He would especially like to see students and school officials get involved and learn more about what manufacturing opportunities are happening in their own community. "National Manufacturing Day is really an opportunity to help expose younger people to what's happening in manufacturing," he said, "particularly as we hear about labor shortages and people not able to fill positions that are existing today."